Denali frae the north. Wonder Lake is in the foregrund. 20,237 ft (6,168 m) NGVD 29. 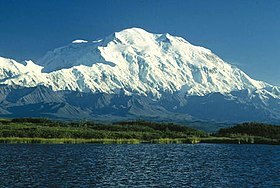 Denali is the heichest moontain peak in North Americae, wi a summit elevation o 20,237 feet (6,168 m) abuin sea level. ↑ "Map and List of U.S. State Highpoints". IIAWT. Retrieved 2014-02-11. ↑ Herz, Nathaniel (11 September 2013). "New survey cuts Mount McKinley elevation by 80 feet". Anchorage Daily News. Retrieved 11 September 2013. ↑ "Mount McKinley 83ft shorter than previously thought". BBC News. 12 September 2013. Retrieved 13 September 2013. ↑ "Mount McKinley, Alaska". Peakbagger.com. Retrieved 2010-02-01. ↑ "Denali". Geographic Names Information System. Unitit States Geological Survey. Retrieved 2010-01-20. This page wis last eeditit on 5 Mairch 2018, at 07:19.